Definition at line 43 of file route.hpp. Definition at line 51 of file route.cpp. Definition at line 57 of file route.hpp. Definition at line 63 of file route.hpp. Definition at line 69 of file route.hpp. Definition at line 75 of file route.hpp. Definition at line 81 of file route.hpp. Referenced by nfd::rib::RibUpdateBatch::add(), nfd::rib::compareFaceId(), nfd::rib::compareFaceIdAndOrigin(), nfd::rib::RibEntry::findInheritedRoute(), nfd::rib::Rib::insert(), nfd::rib::operator<<(), nfd::rib::operator==(), nfd::rib::RibEntry::removeInheritedRoute(), nfd::rib::RibManager::slRenew(), and nfd::rib::sortRoutes(). Definition at line 82 of file route.hpp. Referenced by nfd::rib::compareFaceIdAndOrigin(), nfd::rib::operator<<(), nfd::rib::operator==(), and nfd::rib::RibManager::slRenew(). Definition at line 83 of file route.hpp. Referenced by nfd::rib::RibEntry::getRouteWithLowestCostAndChildInheritByFaceId(), nfd::rib::RibEntry::getRouteWithLowestCostByFaceId(), nfd::rib::RibEntry::getRouteWithSecondLowestCostByFaceId(), nfd::rib::operator<<(), and nfd::rib::operator==(). Definition at line 84 of file route.hpp. 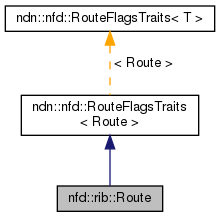 Referenced by getFlags(), nfd::rib::RibEntry::insertRoute(), nfd::rib::operator<<(), and nfd::rib::operator==(). Definition at line 85 of file route.hpp. Referenced by nfd::rib::RibEntry::getPrefixAnnouncement(), nfd::rib::operator<<(), nfd::rib::operator==(), nfd::rib::RibManager::slAnnounce(), and nfd::rib::RibManager::slRenew(). The prefix announcement that caused the creation of this route. This is nullopt if this route is not created by a prefix announcement. Definition at line 91 of file route.hpp. Referenced by nfd::rib::RibEntry::getPrefixAnnouncement(), nfd::rib::operator<<(), nfd::rib::operator==(), and nfd::rib::RibManager::slRenew(). Expiration time of the prefix announcement. Valid only if announcement is not nullopt. If this field is before or equal the current time, it indicates the prefix announcement is not yet valid or has expired. In this case, the exact value of this field does not matter. If this field is after the current time, it indicates when the prefix announcement expires. Definition at line 101 of file route.hpp. Referenced by nfd::rib::RibManager::slAnnounce(), and nfd::rib::RibManager::slRenew().